The focal point of The Grove (website) is a landscaped park area featuring a "dancing" fountain choreographed to the music of artists such as Frank Sinatra and Dean Martin. Other points of interest include The Spirit of Los Angeles, a statue by sculptor De L'Esperie, and Glockenspiel, a musical clock on the dome at The Grove. The Grove provides an extensive selection of retail stores and restaurants that will please even the most discerning shoppers. Many of the stores veer toward the higher-end, such as Barneys New York CO-OP, Johnny Was, Michael Kors, Splendid, Nordstrom, and Theodore, though there is a sampling of affordable options including Chico's, Forever 21, Gap and J. Crew and MAC Cosmetics on-premise. Young girls will go gaga over the American Girl Place, while the flagship Apple store can entertain techies for hours. Bookworms will revel in the three-story Barnes and Noble. As with the shopping options, most of the restaurants tend to be moderately priced or higher. Chain restaurants such as The Cheesecake Factory and Maggiano's Little Italy are on-site, as are only-in-L.A. spots such as The Farm of Beverly Hills and The Whisper Restaurant and Lounge. 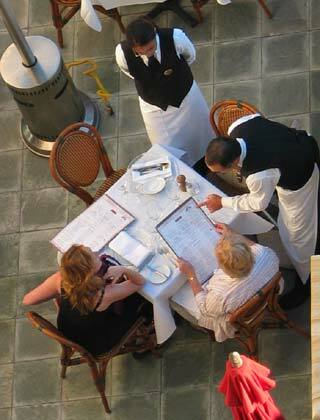 Making for prime people-watching, most restaurants offer outdoor dining in The Grove's plaza-like setting. Those looking to grab a quick bite (or save some cash) will find kiosks such as All American Sausage Co., Haagen-Dazs and Wetzel's Pretzels. Compared to the international array of vendors at the Farmers Market, most of The Grove's eateries are unabashedly American. 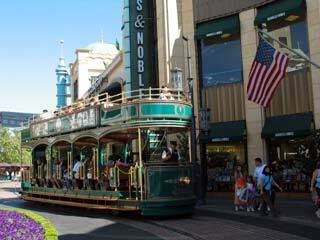 When it comes to entertainment, The Grove has got it. In addition to the infamous dancing fountains, it frequently hosts live musical entertainment. Further, the Pacific 14 Theatres on-premise is a main attraction for many. Come the holiday season, the Grove goes all out with a 110-foot Christmas tree (the tallest in Los Angeles) and fake snow. There are only a handful of American Girl stores in the United States, but you can find one of them at the west end of The Grove (the section near Farmers Market). American Girl offers various dolls and related accessories for girls aged 3+, and also for 8+ years old. What makes this store unique is the depth of the accessories and amenities for the dolls they sell. In addition to clothes, furniture and accessories for American Girl's line of dolls, there is also a beauty salon where your child can watch her doll's hair get styled; there is a magazine photography session for dolls and their owners; there is even a restaurant where doll owners can have brunch with their dolls (and their parents too!). If you have a girl who is interested in dolls, then the displays at American Girl will keep her fascinated for quite some time. Not surprisingly, given the two venues' endless options, The Farmers Market and The Grove both attract an eclectic crowd comprised of locals and tourists. With a single stop on West Third Street and Fairfax Avenue, guests can easily satisfy all of their food and retail cravings, while getting an up-close look at L.A.'s past and present.